Hard Air Magazine offers an expanding selection of hard copy airgun books. These books give detailed information on particular airgun models. There you will find masses of information that will be of interest to anyone who’s thinking about these specific airguns. If you’re looking to buy one of these airguns, HAM books will provide a huge amount of information for you to make a buying decision. They’re a low cost way to research in depth before you splash out on the product. If you already have the particular model covered, HAM airgun books will help you to make the most of your investment and enjoy every facet of owning and shooting them. There’s a ton of value either way! Hard Air Magazine does not sell these books directly. To buy any of our titles, please check out the descriptions below. Each one contains a link to reputable dealers and/or to Amazon. You can buy from them with confidence. 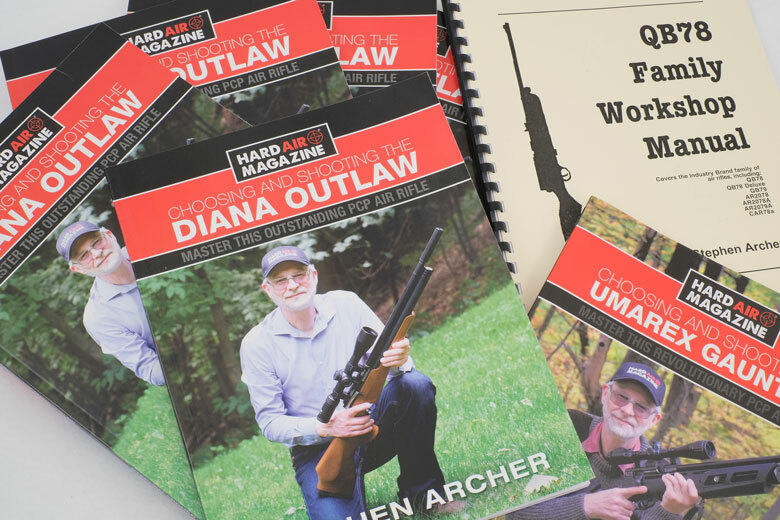 This new Diana Outlaw airgun book from Hard Air Magazine is ideal if you have this excellent PCP, or if you’re thinking about buying one! Choosing and Using The Umarex Gauntlet is the first Hard Air Magazine hard copy airgun book. It’s written by HAM Publisher Stephen Archer and gives a vast amount of information on this revolutionary PCP air rifle. The QB78 Family Airgun Workshop Manual was Stephen Archer’s first hard copy airgun book.